When the year 1989 started, things did not look so rosy for the traditionally stylin’ and profilin’ of the Nature Boy Ric Flair. The National Wrestling Alliance was going all in with new investor Ted Turner on TBS as the renamed World Championship Wrestling while his must trusted partners in the Four Horsemen (Arn Anderson, Tully Blanchard, and JJ Dillon) all flew the coop to the WWF. A behind-the-scenes power play had also run its course as Dusty Rhodes, Flair’s greatest adversary for the past five years, was unhappy with his soon-to-be diminished role in the creative department took his talents up north. For the first time since 1983 (when this series began), Flair had to go it alone and hold the fort as the standard bearer in a struggling wrestling company. What followed was maybe the greatest year any individual professional wrestler has ever had. It began with the reintroduction of his former Mid-Atlantic arch rival Ricky “The Dragon” Steamboat in a tag match on the flagship program. The only way to describe Flair and Steamboat’s rivalry in the first half of 1989 was that it was wrestling heaven. While continuing to play a wily heel, but also one who profoundly respected the face, Flair’s trilogy of matches with Steamboat at Chi-Town Rumble in the UIC Pavillion, Clash of the Champions VI in the Superdome, and WrestleWar in Nashville Municipal Auditorium went on to become the ultimate in critical acclaim, a trio of masterpieces from two performers at the top of their game. But the fun continued for Flair as right after his title win over Steamboat at WrestleWar, match judge Terry Funk brutally attacked Flair and piledrove him on a table, putting him out of action for months. While the feud with Steamboat had a foundation of familiarity and respect, the one with Funk was a beast all its own involving a man so wild and sadistic that the only way for Flair to defeat him was to fight fire with fire. Although it didn’t end cleanly, Flair’s match with Funk at the Great American Bash was one of the best matches on one of the most revered wrestling shows of the entire 1980s. Flair would team with, of all people, Sting as company babyfaces against Gary Hart’s gang of Funk and the young Great Muta to main event the first ever Halloween Havoc. Then Flair put the finishing touches on his epic rivalry with Funk at Clash of the Champions IX when he fought him in a violent “I Quit” Match. Flair’s figure four made Funk say those two little words, but the victory said so much more for Flair’s legacy at NWA/WCW as we closed out the 1980s, a decade in which he and WWF Champion Hulk Hogan ruled the wrestling land. As the winds of change blew through World Championship Wrestling spelling the end of the territory era from which he had made his name, Ric Flair proved to the doubters that he wasn’t done yet as a peak performer. In fact, he was just getting started. It was an interesting year in the grappling game, with both major companies trying new things at the top to varying results and numerous booking overhauls coming about thanks to a decided decline in business. 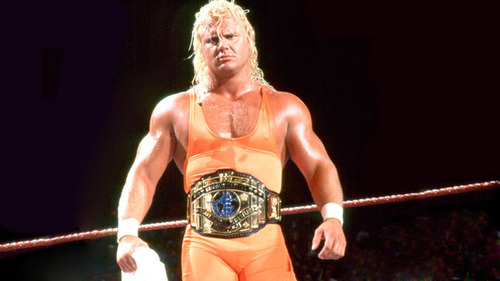 With so much turmoil at the top, it’s natural that the talents that shined most were in the midcard and upper-midcard – Lex Luger in WCW and 1990’s Wrestler of the Year and the man who dominated the WWF Intercontinental Championship: Mr. Perfect. Arguably no wrestler, short of the Ultimate Warrior, had more momentum coming into 1990 than Mr. Perfect. He was riding an unbeaten streak on TV, engaged in entertaining feuds with top stars Warrior and Hulk Hogan, and seemed bound for a feud with whoever came out on top at WrestleMania VI. While that never really came to fruition, he did wrap up a fun run with those two before capturing the vacant IC title in a stellar bout with veteran Tito Santana. Jettisoning the Genius for far superior manager Bobby “The Brain” Heenan only added to Perfect’s star power, allowing him to maintain a virtual stranglehold on the belt for more than a year. While it can be argued that Hennig’s best matches didn’t come from this year, there are few suitable candidates who had more consistently good bouts. 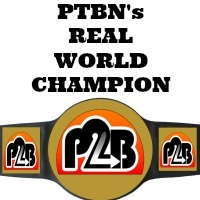 Matched with his promos and his incredible selling that made the worst opponents look credible, Perfect was PTBN’s Real World Champion of 1990. In an overall putrid year for United States wrestling, utilizing a “devil you know” philosophy became a benchmark for selecting a candidate for 1991. Hulk Hogan was certainly hotter in other years in the 1980s, but it is tough to argue against the fact that after the failed Ultimate Warrior experiment of 1990, he regained his role as the undisputed #1 focal point of WWF in 1991. Regardless of your opinion on the Gulf War angle with Sgt. Slaughter, it was the most focused and well established feud of the first eight months of the calendar year in the WWF. After the Gulf War angle was blown off at SummerSlam, more emphasis became placed on angles and feuds such as Jake Roberts vs. Randy Savage. However, Hogan still had a lot going on with his interactions with Sid Justice, the debuting Ric Flair and fending off newcomer the Undertaker. Hogan turned in one of his best in ring years of 1991 wrestling a variety of different matches. 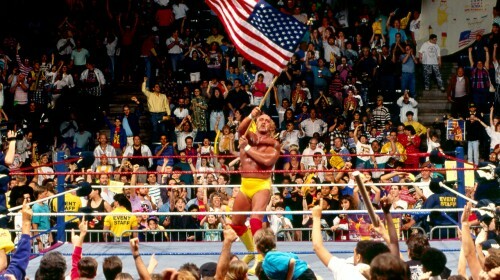 The WrestleMania VII main event was a long brawl featuring weapons and blood, the house show series vs. Flair displayed Hogan being an alpha-babyface defending his territory, and the series of matches vs. Taker showed Hogan in a more vulnerable state than the viewer was used to seeing since he became the ace of the promotion. Hogan may have not have had as many career highlights in 1991 compared to other years, but he did sustain a consistency from a popularity, push and in ring standpoint that few others had throughout the entire year.